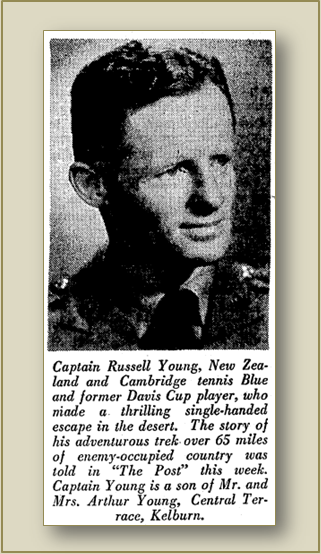 I located two photographs of Captain Russell Young in The Evening Post. I haven't yet found the story mentioned in the caption, but will keep looking. - Te Awhi Manahi 19 Sept 2013. The Evening Post, 29 July 1942, p3. Found it, it was published two days earlier on the 27th July, under the title 'Trek By Night: A Thrilling Escape'. 'Trek By Night, a Thrilling Escape' The Evening Post, 27 July 1942, p7.